It’s a tradition that keeps on giving. 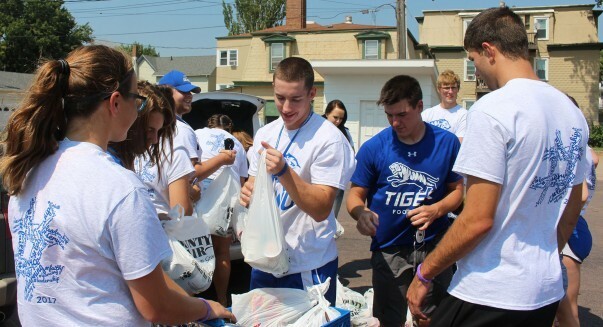 The Dakota Wesleyan University Freshman Food Drive is set for 1 to 3 p.m., Sunday, Aug. 19, around Mitchell. Freshmen, with the help of their upper-classman leaders, will go door to door to ask for donations of nonperishable food items for the Mitchell Area Food Pantry. Mitchell residents will know DWU students by their DWU T-shirts and anyone who is not home during that time, but wishes to donate, can leave their items in a bag by their front door. The Mitchell Area Food Pantry, located on First Avenue, is running low on donations, Van Meter said, and the pantry could use pasta and cereal especially, but all donations will be appreciated. Dakota Wesleyan’s New Student Orientation weekend is Aug. 18-19 with Digital DWU rollout on Monday, Aug. 20, and classes beginning on Tuesday, Aug. 21. The annual Welcome Fest, formerly known as Community Plunge, another freshman-oriented event, will be from 5 to 6:30 p.m., Wednesday, Aug. 22, in the Sherman Center.